Businesses who upgrade to Office 365 need a way to tie Act! CRM data with Office 365 cloud accounts. These cloud accounts are powered by Exchange ActiveSync technology that all mobile device manufacturers support. If you can sync Act! with Office 365, you can use the cloud to serve as an integration hub to phones, tablets and desktop email software with contacts and calendar storage. For example, people can store Act! contacts, activities, notes, and histories on Android, iPhone, iPad, Windows Phone, BlackBerry, and PCs and Macs with Outlook desktop clients. Office 365 serves as an Exchange ActiveSync connection to phones, tablets, PC, and Mac. CompanionLink has both individual and server software that keeps Act! synchronized with Office 365 accounts. Data synchronizes automatically for a set-and-forget experience. Alternatively, you can set CompanionLink to synchronize Act! securely and direct to Outlook 2013 desktop software that comes bundled with Office 365 subscriptions. This creates a secure cloud-free setup for people who choose not to host client data, notes, and history in the cloud. With a feature called DoubleLook Mode, CompanionLink automates the Outlook sync. 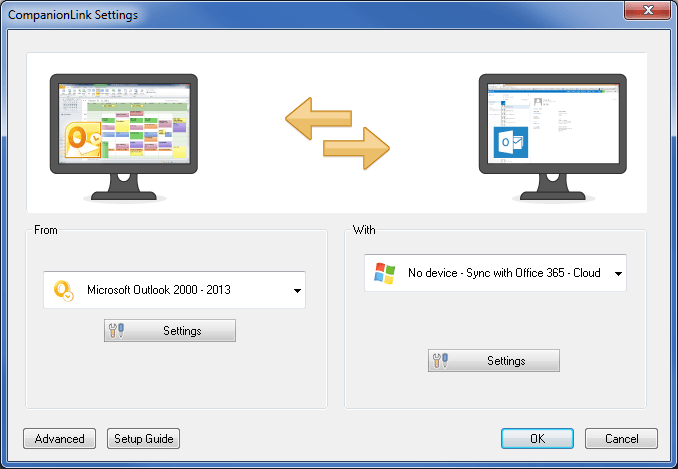 Here is a convenient setup guide for using Outlook 2013 without the Office 365 cloud. Visit www.companionlink.com/office365/act for more information about Act! to Office 365 integration. For advanced Act! 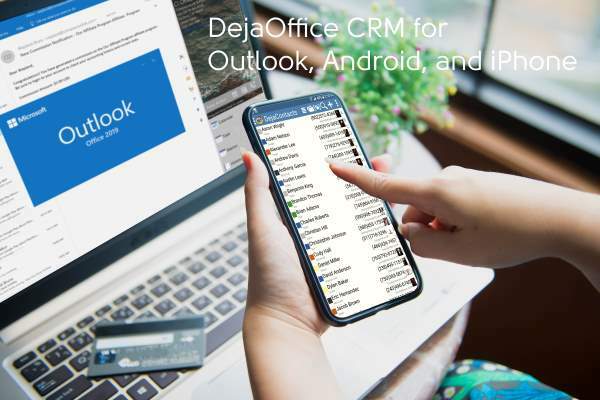 users who want an Act!-like app on their mobile device, we have a free app called DejaOffice CRM (Andriod, iOS, Windows Phone, Blackberry) with views for Act! fields like Notes, Histories, Linked Activities, and Groups (ID/Status). The app syncs direct to Act! using DejaCloud, USB, or Wi-Fi technology. More info here. Microsoft rebranded their online Office app suite as Office Online. It was previously the product known as Office Web Apps. They introduced a new home page with tiles of the apps you have access to online – People, Calendar, Email, Word, Excel, PowerPoint, OneNote, and the new OneDrive document and file storage service. This rebranding does not change CompanionLink’s two-way sync with the People and Calendar apps for Office 365, Outlook.com, and Office Online accounts. The only difference is that People and Calendar are now accessible tiles in the Office Online interface. For people running desktop MS Outlook 2010 and prior, CompanionLink offers the missing connection to Office Online and Office 365 accounts. These versions of Outlook have no way to automatically integrate desktop contacts, calendar, tasks, and notes with Microsoft’s cloud. CompanionLink for Outlook is a plug-in that automates the integration between Microsoft’s cloud and Outlook 2010, 2007, and 2003. Here is a setup guide that shows you how to configure PC Outlook to Office Online and Office 365. When you purchase an Office 365 subscription, you automatically get a license to the Office 2013 PC Install software with Outlook, Word, Excel, and PowerPoint. This means you do not have to store your data in the Office 365 Cloud. You can pay for an Office 365 subscription, download the Office 2013 PC Install, and set up your existing email provider instead of the Office 365 email account that Microsoft creates during sign-up. CompanionLink now synchronizes Act!, GoldMine, and Salesforce CRM direct to both Office 365 Cloud accounts and Outlook 2013 PC Install. PC Outlook includes features not found yet in Office 365 Cloud such as calendar with linked contacts, notes, and better control over categories/groups. The difference is bigger than you think, especially for your pocketbook. Office 365 is a subscription service that gives you a license to download Microsoft Office 2013 to your desktop or laptop. Your PC Office applications (Word, Excel, Outlook, and PowerPoint) can be set up to automatically update your Office 365 Cloud account that comes with the subscription. Office 2013 is the desktop Microsoft Office suite for the traditional one-time cost. There are no subscription fees because you are not using the Office 365 cloud account. The following guidelines are based on our understanding of common use cases. Your specific needs may mean there is a better deal than our guidelines. Are you a single user, or do you need Office for multiple users or multiple PCs? Do need or want the Cloud to access your Office applications? Do you upgrade every time a new version of Office is released? If you are a single user and do not upgrade Office often (historically, new versions have been available every 3 years), Desktop Office 2013 for a one-time cost starting at $219 per person is the best deal. You will save on annual subscription fees. If you are a small business and do not upgrade your version of Office often and do not need the cloud, Desktop Office 2013 for a one-time cost starting at $219 per person is your cheapest option. If you are a single user and upgrade your version of Office every time a new version is available, Desktop Office 2013 one-time cost starting at $219 per person remains your best deal. However, for about $75 more over the span of three years (the average time to a new version), you may enjoy the convenience of Office applications and data in the Office 365 cloud and Exchange email service. If you are a household with multiple computers, Office 365 Home Premium subscription is your best deal. For $99 per year, your entire household gets Desktop Office 2013, Office 365 Cloud, Exchange email service, and free upgrades to future versions of Office. If you are small business that upgrades often or needs the Cloud, the Office 365 Small Business Premium subscription is your best deal for $150 per user. Office 365 subscriptions are set up as Microsoft Exchange accounts. This means you can set up an Exchange Account on any mobile device and get your Office 365 Email, Contacts, and Calendar. If you need tasks, notes, and categories on your mobile, or if are looking for an Outlook-like app for your phone or table, use the DejaOffice app available for Android, iOS, Windows Phone, and BlackBerry. It integrates your mobile device with Outlook 365 and Desktop Office Outlook 2013. For documents, users of Apple iPhone and iPad can download the Office Mobile for Office 365 subscribers app (iPhone/iPad, Android). You can access Word, Excel, and PowerPoint documents.